Perhaps in none of the large Indian states is the verdict of the recent elections harder to decipher than Andhra Pradesh. Here, the 2004 picture -- of a Congress/Telengana Rashtriya Samiti ("TRS") alliance opposing the ruling Telegu Desam, part of the BJP-led NDA coalition (the state assembly elections coincided with parliamentary elections in both 2004 and 2009) -- was complicated by the formation, nine months ago, of the Praja Rajyam Party ("PRP"), led by Telugu superstar Chiranjeevi. The PRP's entry into the fray immediately raised the question as to which of the two major parties in the state would benefit more from the newcomer, with conventional wisdom leaning toward the conclusion that the PRP would split the anti-Congress vote, thereby harming the Telegu Desam (itself founded in the 1980s by a Telugu filmstar, the legendary N.T.R; the party's current leader, Chandrababu Naidu, was N.T.R. 's son-in-law, although he took over the party after what was widely seen in the state as a stab-in-the-back of its founder-leader). While the PRP might well have under-performed relative to expectations that Chiranjeevi might repeat N.T.R. 's achievement over two decades ago (such expectations were always unrealistic, given that N.T.R. 's Telegu Desam benefited from being the only plausible anti-Congress alternative in the state back in the 1980s; today, the anti-Congress political space is far more crowded), 15% of the vote, a mere nine months after the party's formation, is no mean achievement (the well-established Telegu Desam only garnered 24.93% of the vote, and the winning Congress, 38.95%). If the PRP can hold on to this vote-share, let alone build on it, it cannot be written of as a credible non-Congress alternative in the state (indeed, the low correlation between the party's vote-share and its Lok Sabha seat-share, suggests that the PRP's votes might have been relatively spread out across the state, rather than mostly clustered around the Kaapu-heavy districts of north and coastal Andhra, as many had predicted (Chiranjeevi himself is a Kaapu). This would be bad news for the Telegu Desam, if indeed the PRP drew most of its votes from that party. I remain skeptical as to whether one can simply assume that has happened: the difference in vote-share between the Telegu Desam and the Congress is rather large -- 14.02% --, and has actually increased since 2004, when it was 8.44% (see here, pg. 148); indeed, the Congress is ahead by over 5% even if the vote-shares of the Telegu Desam and all its Third Front allies (i.e. the TRS and the two Communist parties) are added together. ** And while the PRP's emphasis on farmer suicides and other agricultural issues during the campaign would presumably have drawn some votes from the Congress, it is doubtful whether these votes would otherwise necessarily have gone to the Telugu Desam, given that Chandrababu Naidu is hardly seen as the most pro-farmer of the three party leaders -- doubtless many rural Andhra voters have not forgotten Naidu's neglect of them as Chief Minister (1995-2004), when he lavished attention on Hyderabad. Even in the absence of the PRP, the Congress was more likely to have been viewed as the more-pro-rural option, not least because of UPA-enacted federal measures like the National Rural Employment Guarantee Act and last year's $15 billion loan waiver sop to the struggling agricultural sector. I don't mean to overstate the point: the above notwithstanding, there can be little doubt that the PRP's presence diluted whatever anti-incumbency benefit the Telegu Desam might otherwise have hoped to garner (that some anti-incumbency existed may be gauged from the fact that the Congress' 2004 41.56% vote-share (34 seats contested) has declined to 38.95% (all 42 seats contested)*, and, given the first-past-the-post electoral system, the possibility that the PRP's presence had a significant impact on the number of seats the Congress won cannot be ruled out; the party actually won four more seats this time around than its 2004 29-seat tally (select "Andhra Pradesh" from the drop-down menu here). [But check out this piece, suggesting that the tiny Lok Satta party, as opposed to simply the PRP, might have cost the Telegu Desam some seats.] 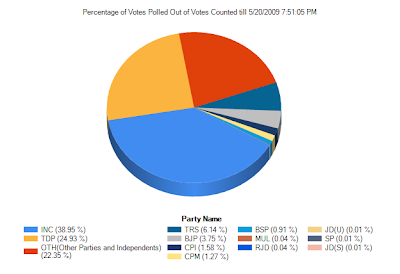 In any event, whining about the PRP playing spoiler won't get the Telegu Desam very far, unless Naidu's party can demonstrate why it should remain the premier non-Congress party in Andhra Pradesh (indeed, the PRP could legitimately claim that it was hard done by, given that it got ~62% as many votes as Telegu Desam did, but with no Lok Sabha seats to show for it; and in the assembly elections, the Telegu Desam and the Congress got, respectively, 75% and 125% the votes that PRP did, but won (respectively) over five and nearly ten times the number of seats). So far, the Telegu Desam hasn't done so, mirroring the BJP-Congress divide across the nation: under Naidu's leadership, the Telegu Desam seemed as much in favor of economic liberalization when it was in power, as the Congress is at present, with the added disability of trying to overcome rural voters alienated by the party's pre-2004 rule (a turn of events that would surely have shocked N.T.R.). Indeed, the Telegu Desam faces an even more challenging identity issue than the BJP does, given that Naidu's party is just as "secular" as the Congress is; as for the rest, it is no more rural-friendly than the Congress, and cannot be said to have handled the state's economic trajectory any better or worse than that party. The Telegu Desam's tie-up with the Third Front this time around was presumably an attempt to mend fences with these rural voters, although the general lack of credibility of the Left-led formation, and the suspicion that it was simply a collection of disparate parties looking to eventually bolt to either the UPA or the NDA, probably hurt the Telegu Desam in the state. For now, Naidu might be tempted to wait out the current Congress wave, but the PRP's presence has reduced the Telegu Desam's room to maneuver: if the party misreads the 2009 election results, and assumes that its status as the permanent non-Congress alternative in Andhra Pradesh, is a permanent one, it will have made a very big mistake indeed. The Telegu Desam's best bet is probably to return to its rural, populist, that is to say leftward, roots -- its history should ensure it an advantage over the PRP, which so far is a one-man show that cannot yet have laid down deep roots in Andhra Pradesh -- so that it is seen as a credible alternative to the Congress, rather than more of the same, with only the identity of the community-coalition underpinning each party subject to change. As the party of the status quo, and with the PRP nibbling into the margins by attempting to stand for change and speak in a strident pro-farmer voice, the Congress can only benefit from this sort of stasis. The second link under * does not seem to be te right one.